We’ve decided to do something a bit different for our last issue of 2018. To honor one hundred years of Women’s League – and one hundred years more – New Outlook will spotlight exceptional sisterhoods, communities, and individuals who have made a difference in their world. Whether running a clothing drive or serving meals to those in need, Women’s League members are leading the charge and taking action. Though many of these projects started out small, they have led to recurring programs, strengthened community bonds, and numerous lives and organizations being enriched as a result. 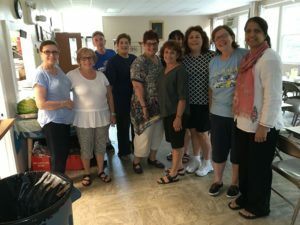 Forest Hills Jewish Center Sisterhood has had an ongoing relationship with Transition House, a shelter for victims of domestic violence and their families. Often, these families arrive at the shelter with little more than the clothes on their backs and $5.00 in their pockets. Since families stay only six months, there is frequent turnover and constant need. In 2015, we planned a social event on December 16. When we discovered that it was Mathilde Schechter’s birthday, we made it a birthday party complete with party hats, games and favors. But what about gifts? After all, you can’t give gifts to someone 156 years old. Instead, we wanted to give gifts to women in need. We first contacted a social worker who worked with our congregation. Through her, we found out about Transition House. At that first event, we guessed probable needs like toiletries and school supplies. The event was a huge success. We scheduled another drive to coincide with our fall kickoff meeting and invited a speaker from the shelter. The entire congregation contributed to this drive, which centered on back-to-school needs. The results were overwhelming. Finally, we had to shut down donations because of space and building staff limits. After those initial drives, we learned a lot about domestic violence and how best to meet residents’ needs. We now schedule three to four drives a year, each with a different theme. We accept new and gently used items. Before each drive, I consult with the assistant director of the shelter to find out the needs, ages and clothing sizes of the families. We target these needs as much as possible. We now hold annual back-to-school drives, as well as drives at the beginning of the summer for swimsuits, towels, and beach toys, since the shelter is near the beach. We also did a November-December drive, which emphasized gifts for teens and involved our own youths. Traditional gift drives collect toys for needy children, but teenagers get lost in the mix. We have accepted household goods and “dress-for-success” clothes in the spring when our members are cleaning out for Pesach. In addition, we schedule special individual pickups from our members who are renovating, moving, or cleaning out a parent’s home. Transition House picks up donations from us to limit how many people know their location. They usually pick up at least twice per drive because of the volume of donations. After the pickup, staff members pull out some items for specific families. Some toys and books are for their onsite daycare center. Then they set up a “store” for the residents to choose what they want from the other items. They share what they can’t use with another longer-term shelter under the same director. Last summer, the assistant director heard children’s voices shouting excitedly, “We’re going to the beach!” after they saw the bathing suits and toys. On another occasion, a new arrival came into her office crying that she had no clothes for her infant daughter. She was able to reassure the resident, “Don’t worry. We have clothes coming for her tomorrow.” One of our members, who has a one-year-old, had scheduled a special pickup when her apartment was being renovated. Marcia Belgorod is the Co-President of Forest Hills Jewish Center in Forest Hills, NY. “This past year, we have partnered with an elementary school and collected whatever the kids might need. In the past, the school has asked for pencils, notebooks, and underwear. This year, they are asking for backpacks and school uniforms. We collect requested items throughout the summer, then sorted and delivered them to the school. There are many people who have fallen on hard times, people who are homeless and are in need of help. Sisterhood member Melanie Goldstein, saw a need and created our “Shared Meals” program. Since we cook food in our homes (even if it’s Kosher), we cannot bring it into the synagogue. So, we partnered with the Bensalem Presbyterian Church across the street from our synagogue and we serve the food in their community room. We have teams from our sisterhood and from the church. Each month, Melanie sends an e-mail to our team of wonderful volunteers letting us know what she would like us to make. The church also provides a team of volunteers. Tables are set, and we invite our guests to sit and enjoy a homemade meal. We serve our guests and make them feel as if they are dining in a restaurant; we engage with them, and make them feel welcome. Our teams prepare the meal, set up, serve, and clean up. A typical meal would have a tossed salad, bread and dinner rolls, chicken, a cooked vegetable, a starch, dessert, and hot and cold beverages. The type of starch and dessert varies each month. We have so many wonderful volunteers, and our guests are so grateful for a home-cooked meal. And all of the food is donated by our volunteers. We have some seed money from donations at our Interfaith service in November. This is truly a mitzvah and an opportunity to give back to the community! Sandy Berenbaum is the Consulting Services Chair and Services to Sisterhood Team Lead for Women’s League. 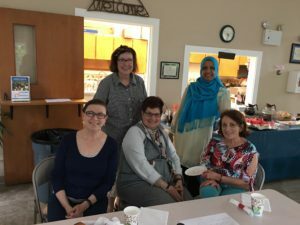 She is also Torah Fund Co-Chair for Sisterhood of Congregation Tifereth Israel of Lower Bucks County in Bucks County, PA. For more information on this and other programs, contact her at sberenbaum@wlcj.org. 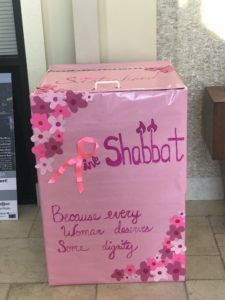 This past year, my Sisterhood partnered with two organizations: Sharsheret, a national Jewish organization that helps women who are suffering from breast cancer, and Distributing Dignity, a local organization that collects new bras and feminine hygiene products to distribute to people in our community and all over the U.S. who are in need of such products. We put a big, pink container in our shul’s lobby and collected products all year. Once we collected at every major Sisterhood event, our bin was overflowing when our Sisterhood participated in MLK Service Day. We had a Sharsheret Pink Shabbat, where we had survivors talk from the bima. We had representatives from Distributing Dignity come to a board meeting to educate us. Our whole year of collection was an absolute success! Working with Sharsheret was terrific, as they provided us with brochures, packets of information about breast cancer and detection, and other goodies we were able to give to all our congregants. Our pink box is still in our lobby, and we plan on keeping it there again this year. There was such an outpouring of love and positive vibes from so many people about our mitzvah project that a group called “Caring Sisters” is going to be a new program this coming year within our Sisterhood. This program will be for anyone who wants to get together and schmooze, talk, cry, and bond about what they are going through or what they have gone through. The program will be small and intimate and will start off in people’s homes. Staci Boiskin is the President of Temple Beth Sholom’s Sisterhood in Cherry Hill, NJ. Sharsheret Pink Shabbat at Temple Beth Sholom in Cherry Hill, NJ. 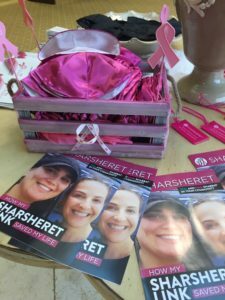 For more information on how to host your own Pink Shabbat, visit www.sharsheret.org. Two members of sisterhood, Martha Kreisel and Linda Shumsey run the “Juliets” at Temple Beth-El of Bellmore. This project started with about eight women playing mah jongg in the temple once a week to socialize and get out of the house. It has since blossomed into a three-days-a-week program that attracts up to two hundred participants – both women and men! – for an afternoon of mah jongg, canasta, poker, or whatever interests them. A nominal fee of $4 is charged to defray the costs of beverages, snacks (no outside food allowed), and utilities. It has been a lifeline to many elderly who have made new social connections – temple membership not required! Each year, we participate in the Making Strides Walk, collect coats for NY Cares, collect school supplies for LI Coalition for the Homeless, collect canned and packaged food for LI Cares, and collect and donate Chanukkah toys to OHEL Children’s Home and Family Services. And, through our fundraising efforts, we were able to support our temple, fund Sisterhood activities, and make charitable donations to other organizations, including Torah Fund. Sue C. Zwick is the President of the Sisterhood of Temple Beth-El of Bellmore, NY. The story doesn’t end here! Do you have a social action or tikkun olam project you’d like us to feature? Send your submissions to Erica Slutsky at eslutsky@wlcj.org, and your sisterhood could be in a future New Outlook!